Behind the Scenes: Forest & Forest Product Research examines research conducted to help us utilize forest resources while managing our forestlands in a sustainable manner. Students will learn about key forest research conducted since the early 1900s, as well as key researchers. 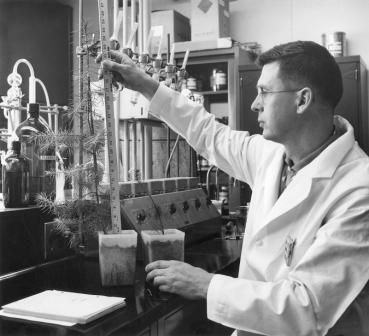 Image Caption: Image 1: Forest Researcher measuring the growth of a pine tree in the lab. The student engages in historical analysis and interpretation; hypothesizing the influence of the past. Students examine economic, social, and cultural developments in contemporary United State. The student will utilize visual and mathematical data presented in charts. Download and Print: Module 11 Teacher Pages & Student Pages PDFs using Adobe Acrobat. For Day 1 activity: Make copies of the Essay for each student in your classroom. Next make copies of Worksheet 1 and 2 for each student. Day 2 activity: Make copies of Eloise Gerry, Carlos Bates, Bruce Zobel, Malcolm Furniss, Jerry Franklinand Kent Kirk biography pages for each student in the class. Make 6 copies of Worksheet 3 for each group or individual student (depending on how you would like to do the activity). Assessment Prep: Make copies of the Assessment you have chosen to use. What resources/products do we use that come from forests? Should you be concerned about using natural resources from our forests? What things do you think researchers study in our forests? How many people do you think own private forests? Why do you think forest research is important? What improvements in wood products do you think we could use today? Now read the essay, “Forest Research & Development History” together as a class (silently at desk or out loud). Assign Worksheet 1 (acrostic poem), Worksheet 2 (Keywords). Assign: Gerry, Bates, Zobel, Furniss, Franklin & Kirk Biographies & Worksheet 3. You may consider dividing the students into groups and assigning one or two of the biographies to each group; allowing time in class for students to read the biographies and complete this worksheet. Discuss: Personality traits of the researchers. Complete "Personality Trait Tally Sheet" at the bottom of the Teacher Instructions page. Arrange a field trip to visit an experimental forest or range near you to view current research, participate in hands-on activities, etc. Invite a Forest Researcher into your classroom to discuss their job and current research activities being conducted in your area. English: Complete Worksheet 1. Or discuss what a biography is and teach students how to be a biographer. Discuss with the students what kinds of information are needed to have a complete biography: name or names, place and date of birth, family, places lived, hobbies, occupations, significant incidents in his/her life, and what made him/her famous. Use examples from Activity 2 to help in this discussion. Possibly have students use these questions to become a biographer (in groups or individually), by writing a biography on other teachers in the school or on a parent/grandparent at home. Math: Have students go to or call a local Recycling Center and find information to answer the following questions. How many aluminum cans need to be recycled to power a TV for an hour? How many hours are there in a year? With these two figures determine the number of aluminum cans needed to be recycled in order to power a TV for a year. You could contact the local recycling center or electric company to find out enough facts to create a worksheet with numerous questions based on discovered facts. Determining the number of cans needed to run the lights in the school for day, the number of pieces of paper or pounds of paper needed to be recycled to create a new ream of recycled paper, etc. Science: Look into research projects currently underway today at the Forest Products Laboratory – Research in Progress. Create your own research project such as, creating a compost pile with your students in the fall and planting a small schoolyard garden in the spring. You could use compost on half of the garden and potting soil on the other half. Then see which part of the garden does better. Some places to look for information on composting: EPA, Pennsylvania EPA Composting Project, and Journey to Forever – School Composting. Aldrich, Mark. “From Forest Conservation to Market Preservation: Invention and Diffusion of Wood-Preserving Technology, 1880-1939.” Technology and Culture 47, no. 2 (April 1, 2006): 311-340. Zerbe, John & Green, Phyllis. “Extending the Forest Resource: 90 Years of Progress at the Forest Products Laboratory.” Forest History Today, (Fall 1999):9-14. Ice, George G. and Stednick, John D. “Forest Watershed Research in the United States.” Forest History Today, Spring/Fall 2004. Forest Products Laboratory, Environmental Technologies (viewed 7/2/07). West, Terry. “Research in the USDA Forest Service: A Historians’ View.” Washington, DC: USDA Forest Service, History Unit, 1990. Havlick, David, “Dr. Eloise Gerry, Scientist-Author-Teacher,” Forest History Society, 2004. Forest History Society Bibliographic resources on forest product research and environmental history. Ordering Resource for: American Forests: A History of Resiliency and Recovery, The Greatest Good Film. PaperRecycles.org teamed up with Scholastic to offer suggestions and ideas for teachers to get there students involved in recycling efforts. Paper University Teaches kids all about paper, use, production, etc. USDA Forest Service, Kids Contains various activities for students to learn more about forests and forest research. Forest Products and Technology Lesson Plan (LEAF Lesson Plan) Students will learn about the work done at the Forest Product Lab by acting as wood scientists.